With the agony that was the way the last book, Monster Museum, ended, I was so eager to get my hands on the newest installment. I had to know what happened next and I knew that it was going to be quite the adventure, both emotionally and physically for Ellie and all her friends and I couldn't of been more excited for it.What I wasn't expecting was how much darker this whole book was going to be. Not only do we get dual point of views but one of those views, is from the very villain himself and I With the agony that was the way the last book, Monster Museum, ended, I was so eager to get my hands on the newest installment. I had to know what happened next and I knew that it was going to be quite the adventure, both emotionally and physically for Ellie and all her friends and I couldn't of been more excited for it.What I wasn't expecting was how much darker this whole book was going to be. Not only do we get dual point of views but one of those views, is from the very villain himself and I couldn't of been more thrilled about it. Oh boy, to be inside his head! The darkness, the rage, the pure horror of it all. Honestly, I loved it! It added such a wonderful touch to not only the book but the series as a whole. This really was an action packed read that had so many emotions to it. From the darker sadder aspects to the more heartwarming ones of friendship and true family. Truly a wonderful addition to the series and I'm hoping, even with all that transpired, we will still have many more volumes to come because I'm really not ready to say goodbye to Ellie and all her friends and the ghosts that thy hunt down. Eleven books in and I’m no where close to being tired of Ellie Jordan, her crew or their escapades. 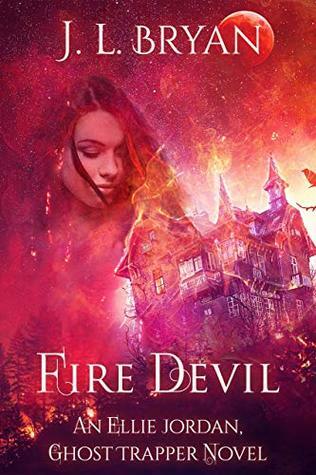 Fire Devil may be one of my favorites in this series so far.Throughout the Ellie Jordan, Ghost Trapper series, readers have known about Clay. He’s only been front and center in a few books, but he’s always there. He’s the reason why she started hunting and trapping ghosts in the first place. In Fire Devil, things finally come to a head and she risks losing everything to take Clay down. Even her ow Eleven books in and I’m no where close to being tired of Ellie Jordan, her crew or their escapades. Fire Devil may be one of my favorites in this series so far.Throughout the Ellie Jordan, Ghost Trapper series, readers have known about Clay. He’s only been front and center in a few books, but he’s always there. He’s the reason why she started hunting and trapping ghosts in the first place. In Fire Devil, things finally come to a head and she risks losing everything to take Clay down. Even her own life.The action and danger didn’t slow down in this one at all. The whole crew was together, with a few additions. Their main goal was to release Michael’s sister from Clay’s clutches and destroy Clay in the process. Hopefully without anyone else getting hurt… or worse… in the process. Along the way they encounter even more restless spirits and solve a few mysteries, while opening up even more. Clay has a sinister plan, which they have to figure out and fast.Ellie learns more than she expected and gains something that she thought was forever lost. Just one of the many reasons why I loved this one so much. I can't wait to see what J.L. Bryan has in store next for Ellie Jordan. 😉 I received Fire Devil in exchange for a fair and honest review. It's the end...right? I bawled, cried, blundered in thanks that Ellie & her team made it through the horrible maze Anton led them through! I was so distraught at the last, but I had the utmost faith in Ellie, I clung to my faith in her and her gang to overtake Anton! And when they overtook that Monster, I bawled and cried in jubilation for an hour at least! Mr.J.L. Bryan deserves accolades of a higher.power. I am so happy here in Oregon believing there are Ellie's & Mr.. Brian's out ther It's the end...right? I bawled, cried, blundered in thanks that Ellie & her team made it through the horrible maze Anton led them through! I was so distraught at the last, but I had the utmost faith in Ellie, I clung to my faith in her and her gang to overtake Anton! And when they overtook that Monster, I bawled and cried in jubilation for an hour at least! Mr.J.L. Bryan deserves accolades of a higher.power. I am so happy here in Oregon believing there are Ellie's & Mr.. Brian's out there deciding ways to fight the netherworld! Because, you & I just never know when another Peshtigi Absolutely frightening, horrifying, and unable to put it down! The Grimm brothers had nothing on J L Bryan! The Peshtigo, Wisconsin Fire was based on truth, unfortunately; which can still be felt in that area today. We can only pray for them, their families, their souls. J. L. Bryan reminds us, and makes us aware of, the stratas and planes of life on Earth as we know it. Absolutely loved this book! It dragged in a few places but I am SO glad we finally figured some stuff out. But I still feel like I missed something with Kara and the paranormal research people.... where the eff did they go? I plan on rereading them all to see what I missed because there are no answers about them in this book. Totally worth the read!! This is the sequel to #10, The Monster Museum, and helps tie up some loose ends. It was an exciting ride from start to finish, with plenty of ghosts and danger for all involved. It also introduced a new character, to help them with exorcising Anton Clay from the body and soul of Melissa. I hope that there are more adventures for Ellie and her gang in the future. Very addictive!I love these books!! That’s all I can say!! You need to read them for yourself! Once you read the first one, you won’t be able to stop until the last one. J.L. Bryan is a great author, who writes an amazing story. My only pet peeve is the back and forth of the spelling of Stacey's name. It fluctuates from Stacey to Stacy, often on the same page.